47.4 percent of Sole Parent Support beneficiaries are Maori. In the Youth and Young Parent category the proportion rises to 49.4 percent. 1/ This disproportion accounts substantially for the high rate of Maori child poverty. 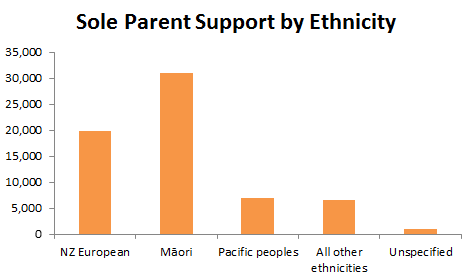 While Pacific children are also disproportionately poor, they are more likely to have working parents. 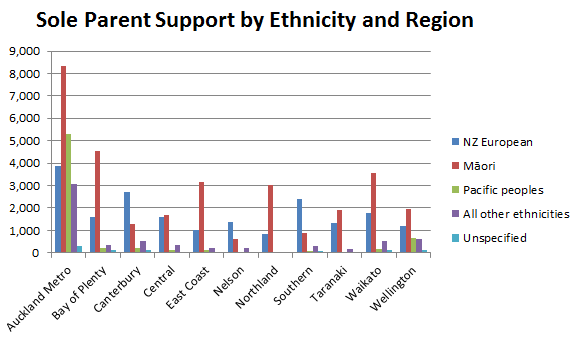 2/ The Maori numbers are dropping. There are 9.5 percent fewer on Sole Parent Support now than at June 2014. I have included the notes regarding ethnicity that accompany the data tables. Ethnicity data is self-identified and multiple ethnicities may be chosen by an individual as fits their preference or self-concept. Multiple selected ethnicities are then prioritised into a hierarchy. The Māori ethnicity has the highest priority in this hierarchy, followed by Pacific peoples. NZ European has the lowest priority. This is to ensure that smaller and politically significant ethnic groups do not get overwhelmed by the larger ethnic groups. A single ethnicity is assigned to an individual based on this hierarchy. 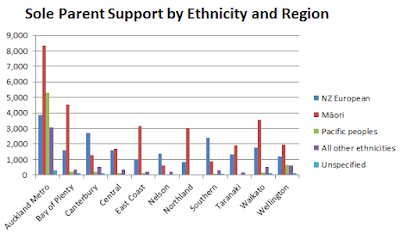 Ethnic groups do not currently align with Statistics New Zealand ethnicity groupings. I'm with Sian Elias. This kind of police work makes me sick. It blurs the lines between right and wrong so badly that it can only make outcomes worse. Using lies and deceit to entrap someone, to encourage worse criminal activity than might otherwise have been the case, and to use oodles of public money to engage in such elaborate baiting is unacceptable. I don't know how we are supposed to trust an organisation that for months sits around conniving more than 20 set-ups to deceive an impressionable, possibly not that bright, young person. How can sane individuals participate in this sort of hoax? And do they have to graduate from acting school? It is bad enough that so many young men live in a virtual reality world that leaves them amenable to propositions to join a glamorous criminal underworld. But the supposed upholders of justice exploiting it? It is a horrible crime to cause the death of a baby but it was manslaughter. Why was the state so hell-bent on punishing this guy (still technically a 'child' when he committed the crime) when he was only ever going to serve a short sentence? If I wasn't so repulsed I would find it risible. I mention it only because the June quarter benefit statistics have not yet been released. 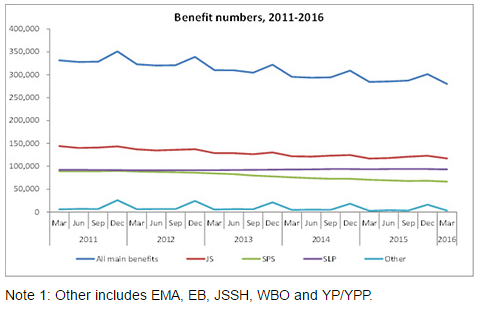 On April 21st the minister issued a release heralding lowest benefit numbers since 2008. On January 21st she made a statement referring to the steady annual decline in numbers. It'll be most interesting to see if the overall downward trend is continuing. And Jo Goodhew gets the job of putting out the release which is remarkably similar to the April 21st version. 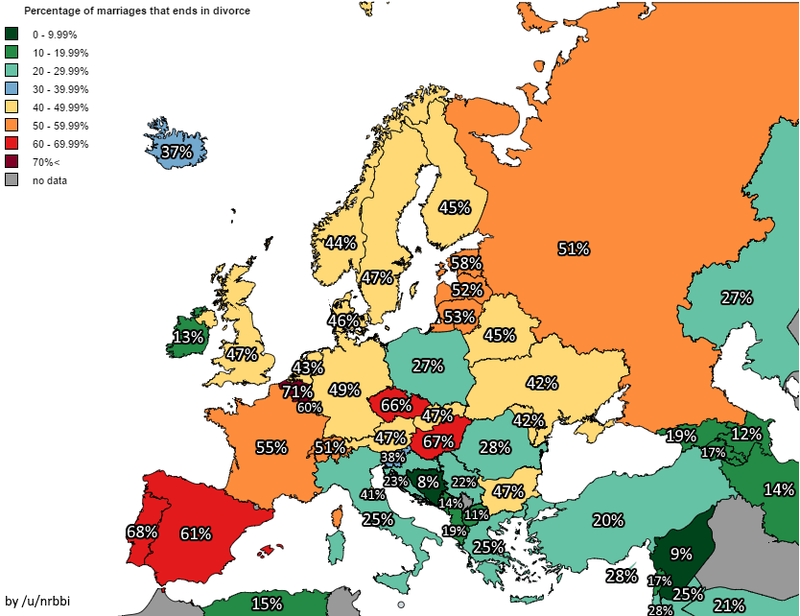 Jim Rose has highlighted the following depiction of "the percent of marriages that end in divorce". The range of percentages from 9% to 71% is fascinating. Naturally the question arises, where would NZ fit in? What colour would this country be? The answer is....we don't really know. This frequently uttered factoid looks like a good reason to save money on an expensive wedding. But can it be true? Statistics New Zealand’s Population Statistics unit records the number of marriages registered each year and tracks how many of these end in divorce. Analysis of this data shows that roughly one-third of couples who married in 1970 had divorced by their jade wedding anniversary (35 years). This suggests that two-thirds of marriages end in the death of one partner. But aren't divorce rates increasing? Of those who married in 1980, one-third of couples had already divorced by their silver wedding anniversary (25 years). This is still well below one-half of all marriages. The longest marriage certified by the Guinness Book of Records is 86 years, although there are longer marriages pending verification. How did this myth arise? There are roughly 10,000 divorces and 20,000 marriages in NZ each year. 10,000/20,000 = 1/2 – so one-half of all marriages end in divorce, right? Wrong! The couples divorcing in a year are not the same couples who marry in that year, but a subset of all those who married in preceding years and have not yet divorced (a much greater number than 20,000). When measuring the frequency of an event in a population (eg divorces) it is important to express the number of events in the context of the population who are likely to experience that event (sometimes called the 'at risk' population). For divorces, that population is the estimated number of existing marriages (from all years past and present). The method used to bust this myth, where divorces are analysed by year of marriage, is known as a ‘cohort analysis’. What the chart above actually shows is the divorce to marriage ratio. Based on that NZ would be 43% in 2015, or the same colour as the UK.